The sirens are screaming. Incoming barrage from SEAX is imminent! Hailing from Massachusetts, SEAX is that rare breed of American metal band that not only invokes the power of a bygone metal age, they personify it. 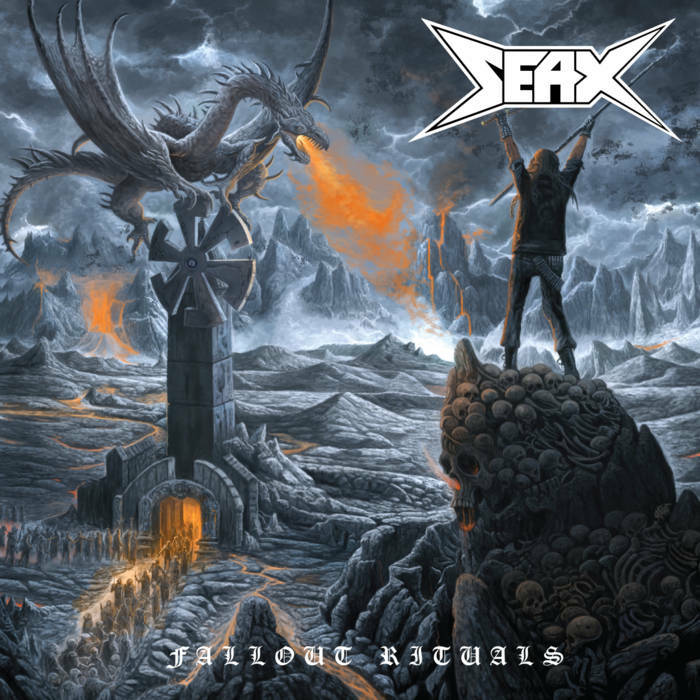 There are very few bands from these shores that pay homage to the raging speed metal sound of the early 80’s and do it right, but SEAX is one. Think of eldritch names such as EXCITER, IRON ANGEL, HAWAII, AGENT STEEL and the like and you’ll instantly know the SEAX sound. Fallout Rituals is the fourth and newest album from these hellbound Yanks and delivers the speed metal goods yet again. I found this and opportune time to speak to them and the answers provided should be considered as coming from the band as a whole. REBEL EXTRAVAGANZA: Greetings to SEAX! Fallout Rituals is your fourth album…what was the main goal for you to accomplish when you recorded this rager? SEAX: Thanks for having us!!! Obviously for Fallout… we wanted to take where Speed Metal Mania left off and progress to the next level. We feel we achieved a more complete album with Fallout…. That was the goal. To create an album that has the SEAX sound. RX: There is a thin line between thrash and speed metal. Where do you see yourself falling along that line? Or does that matter? SEAX: It doesn’t really matter. Personally, I think that our sound has more of a Speed / Heavy Metal vibe. RX: I can hear influences from many 80’s bands in SEAX. Is there one in particular that you draw more inspiration from? SEAX: Not one in particular, no. But I can list some: IRON ANGEL, WARRANT, JUDAS PRIEST, MOTORHEAD and METALLICA, to name a few. RX : There’s a very specific production from the early 80’s that you have nailed perfectly. What’s the secret behind getting that sound so exactly? SEAX: I think that working with the right producer is very important. Eli knows exactly what type of sound we are after. We don’t even have to worry about how the about will sound, because we know that he will nail it. RX: You hail from Massachusetts. What’s the metal scene like there and are there any bands you can recommend from the area? SEAX: It’s actually really good up here. I wouldn’t say it’s just a speed metal scene, though. Whenever there’s a heavy metal, speed metal, thrash (or any kind of metal show really), there’s usually a pretty good turnout a lot of the time. There’s a certain group of people you always see at the shows and everyone is cool for the most part. As for bands, go and check out BLACK MASS, CRYSTAL DAGGER, RECKLESS FORCE, DEMON CHROME, WAELMIST, PANZERBASTARD, HESSIAN, EATEN, HIGH COMMAND and APOLLYON! RX: The USA is a frustrating place for fans of classic metal. Do you get support here as compared to Europe, where the style is more revered? SEAX: Hard to tell to be honest. We can definitely agree as a band that the support In Europe last summer was amazing and humbling. We’re a US band so it is the easiest way for us to tour. Is the support worse? Maybe…but we also get a lot of support here and still feel touring the US is a worthy venture. Plus we try to play fests on the trips which have really helped us, Ragnarokker, Legions Of Metal, Frost And Fire, Spring Bash to name a few. RX: Is there a particular song on Fallout Rituals that you are the most proud of? SEAX: ‘Riders Of The Oldworld’ was the first song that we wrote for this album. It’s fast and chaotic and I feel that it laid the perfect foundation for the rest of the album. RX: Do any of the members play in other bands? SEAX: Razzle also plays in HIGH COMMAND, while Cristiano plays in BLACK MASS. RX: Is there any room for change in SEAX’s sound or are you pretty comfortable with the sound you’ve achieved on Fallout Rituals? SEAX: This is our sound, no need to change it. RX: Any live plans for 2019? SEAX: We are working on a 2 weeks tour for April, and have plans to do another run later this year. RX: Last words for the fans? 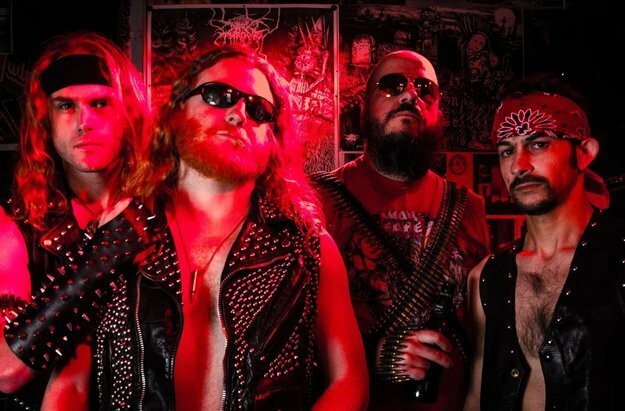 SEAX: The Speed Metal wheels are turning, so watch out!